College Week at Everett Middle School is a BIG Success. We are lucky to have a guest blogger Michele Molitor, California GEAR UP School Services Coach, share with us some of the systemic success at Everett Middle School in San Francisco. Everett Middle School, located in the Mission District of San Francisco, continues to lead the way as a “School on the Move” for California GEAR UP! Everett has set some big goals, and has had amazing results, including an increase API of 40 and 54 points over the last two years respectively. (insert dramatic pause here, these are MASSIVE API gains) This spring has been a busy time for them as they have engaged their staff and students in a variety of College Going Culture activities. 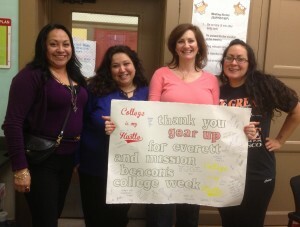 Their latest success story was College Week – held March 8th through March 15th. There was so much enthusiasm for all the terrific information being shared, dinner was delayed so everyone could soak it all up! While everyone shared in a meal together, a powerpoint presentation was shared, reviewing the A-G requirements, college entrance requirements, where to go for help and information about the upcoming college week on campus. Earlier in the day, all students received the “College Making It Happen” booklet along with additional information on college and curriculum from their homeroom teachers on how to find the answers to important college prep questions. Starting on Monday, there was a series of different activities each day for the students. They received a Student Passport, which they were to fill out during the week as they attended the different activities. A completely filled out passport earned them an A-G t-shirt given out by SF Promise. Each day homeroom teachers encouraged students to fill out their passport and learn more about what it takes to go to college, plus they had different college talk points to share with them as well. Students had a chance to get their faces painted with different school logos and take a picture with their high school graduation year as the backdrop. Students had the opportunity to join different college clubs. There was even a booth there about credit cards, to warn students of the interest rates when they borrow money. They brought in real “live” college students too. Students had to interview them and fill out their college bingo sheet to win prizes. A “Tell us about your college experience” teacher panel was conducted so students in the audience could ask questions of the five different teachers on the panel. Overall, it was a powerful week for teachers and students alike. Big kudos to the entire GEAR UP leadership team that coordinated all of the efforts and spent 2 months planning all of the activities! This huge effort was only piece of the puzzle too. Everett has a myriad of other activities going on an any given time to help raise student awareness of what’s needed to go to college, increase parent and community participation and improve student test scores. It’s no wonder that Everett’s API score increased by 94 points in two years! Under the leadership and direction of Principal Richard Curci, Everett’s faculty and student body continue to raise the bar for success – knowing that when given the information, guidance and support Every Student can have the opportunity to go to college!